The season began as usual during the Spring break in early April with games scheduled daily. Owensboro Senior High School baseball opened with a double header at Paducah Riedland High School on a brilliant Spring day, 120 miles West. Most notable to the me was the fact that, during infield practice, Owensboro’s starting shortstop, senior Ford Cox, broke his finger during infield practice and I was inserted at shortstop to plug the hole. In a Wally Pip/Lou Gehrig flashback sort of way, it began 3 years of the same guy – none other than me – playing shortstop for Owensboro, pretty much without missing a start. To describe my emotions would be nearly impossible, what with the thrill of joining so many admired upperclassmen athletes mixed with the pressure of finding myself in such a key position in a moment of overwhelming surprise. The love was nearly impossible to contain. As were the nerves. The Red Devils took the first two games, then went on to amass a ???? (10-2) record for the week. It was a rather remarkable week, all-in-all and I suppose the vividness of it so egregiously amplified by my own set of sensations. Playing the first game behind Kentucky Player of The Year Jimmy Howes in the first game, I collected a couple hits and we swept both games. The drive back was heady business as the ribbing commenced in the popular hazing sort of methodology. I have since believed that shortstops suffer less of this than other players, either that or I got lucky to have such cool team mates. The following games that glorious week included a double header at Louisville Valley High and one game against local Louisville power, Male High School and their much-ballyhooed Bonus Baby pitcher, Walter Harrison. We split the doubleheader against Valley and wandered into the Male game with Jimmy once again on the mound. It was set up to be a solid pitching duel with two of the state’s best locking horns. 1. That we could beat anyone. 2. That the adult-sized players on our club could send balls an awfully long way against any pitchers. A hilarious event also occurred in this ball game. Howes connected for one of the few times in his notoriously terrible batting career and blasted a pop-up which only the state’s 6’ 5” 225 pound shot put and discus champion could hit. He smashed a ball straight up in the air while runners below it circled the bases with 2 out. I mean he connected! It was hit literally so high that we lost track of it, as did the Male infielders. When it finally came down, 5 feet from the nearest circling defensive player on this windless day, Jimmy was standing on second base – and he was not fast! The schedule resumed when school recommenced and we returned home and began a more normal, less cluttered schedule, winning some and losing a few. We endured one of those unseasonable cold snaps for a couple games in sub freezing temperatures. Most memorable of these was a game in Dale, Indiana where the temperature was clearly in the 20’s and hitting a ball felt like punishment. Between innings, players ran up the small rise to the team cars and sat with heaters running, only leaving for inning changes or for the task of getting “on deck” to hit. It was brutal. The redeeming moments came when actions resulted in a win, when someone got a hit and the horns would start honking for either side.The stands were virtually empty but there were a few hundred watching – from automobiles. There was some very unserious mirth involved. It was incalculably weird sitting in cars and talking about extraneous stuff in the middle of a ball game. Of course, complaints about the ridiculous weather were rife as we blew on our hands upon entering. As the season wound down and District Tournament play commenced, the roles on the team were set, as was the pitching. There had been some very uncharacteristic losses during the regular season which concerned Jack owing to our occasional and admitted lack of focus. While the team was solid in most respects, lapses in pitching and in hitting became troubling to Jack. Defensively, however, the team was quite strong, and this became the secret to eventual success at the highest level. But it was vexing to him and it seemed entirely apropos that he relegated our chances for tournament success less than in many years prior. The outfield of Don Wetzel in left, Herbie Kendall in center and All American football player Frank Chambers in right field was fast and sure handed. Kendall, in particular, with Chambers close behind, were hugely quick to the ball and each could hit with power. The infield of David Anderson at first, Jerry “JJ” Pulliam at second, me at short and sophomore Wayne Greenwell or Bobby Williams at third was actually excellent when all was said and done. For my part, I think I made 3 errors in 45 games which is more than respectable. The logic that Jack embedded and which I have never forgotten – “Make all the routine plays!” – was substantially rewarding to maintaining focus on the task of winning. We also had a catcher who was born to play the position in senior leader Jimmy Henderson. We had two ”lights out” pitchers in Howes and Larry Shown, with a more than adequate third starter in lefty James Wellman. Looking back at this team, one can appreciate the elements which propelled their eventual success in the form of a team who coalesced and completely gelled at tourney time. The regular season that year was by all means the lead-in to the Main Act. In District play, we first beat Owensboro Catholic handily in somewhat routine fashion. 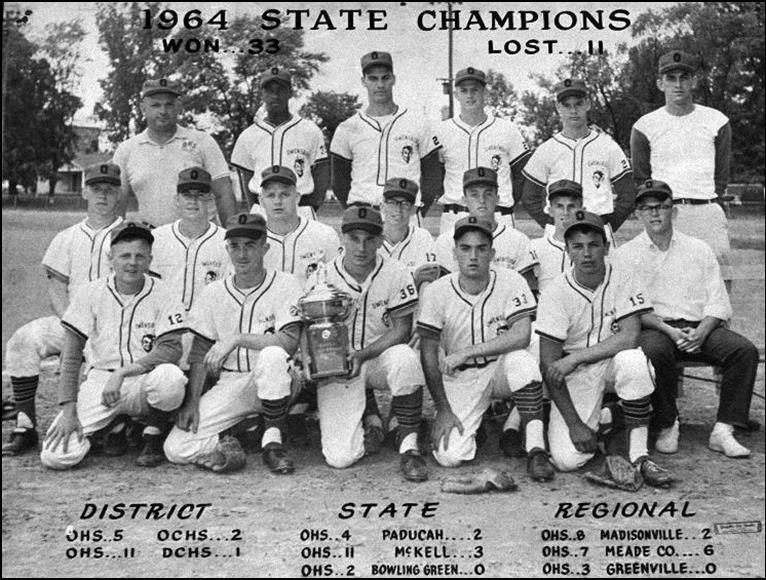 This was one of the last Owensboro Catholic High teams who were of less than highest quality talent. They inevitably became a substantial baseball force in short order which has since never changed. It set up a Final with Daviess County who were playing excellent ball. The District Final that year was noteworthy for two reasons. First, after fastball specialist Larry Shown started the game pitching while Jim Howes was busy 30 miles away in Henderson, qualifying for the State Track and Field finals in the shot put and discus, Howes was madly driven back to the baseball field to take over for Larry immediately upon returning, with our team behind 1-0. I have always relished this bit of lore inasmuch as the individual athleticism required is somewhat staggering in anyone’s galaxy of athletic achievement. That Jimmy would ultimately sign a basketball scholarship with a rebuilding and grateful Tulane University merely adds yet another twist to my contention that Jimmy Howes was the greatest athlete of my generation. But back to the game . It was actually timely, too, because Larry was having trouble shutting them down. Jimmy commenced pitching to Daviess County’s ultimate dismay, pretty much completely shutting them down. The other noteworthy event during this game occurred around the time that Howes made it back to the ballpark. Batting 8th as usual, behind 1-0 in what was shaping up as a seriously pitching-rich ballgame, skinny sophomore shortstop Steve Snedeker hit his first-ever home run. All 155 pounds of me got hold of a Dean Young aspirin tablet and I got every single bit of the ball. Ironically, I had broken my favorite bat in a game prior and I was using a new club when I connected in a spot so sweet it gives chills to this day. It wasn’t a cheap homer either! It cleared the fence and bounced on the road on the other side, 330 feet away. With the lead, we commenced finding more hits off Dean and it all resulted in a mauling. We won the game 11-1 in the end although it does not reflect the tensions which preceded the eventual blowout. Frank Chambers also connected with a shot to center which seemed to go forever, 405 feet from home, one of his characteristic blasts of immense, true power. In the Regional games, it was a legitimate challenge. We easily won our first game, then locked up with Meade County in the semi’s. We encountered a left-handed pitcher for Meade County who would haunt us for a couple years later – Gary Timberlake, who was eventually drafted by the Yankees in the second round in 1966. We won a nail biter 7-6. In the Final against Greenville, we had a classic. Danny Morris of strikeout fame reluctantly gave up 2 runs and we prevailed, 3-0. We were off to the State Tournament. Jack’s interview in the local paper prior to the tourney featured his comment “This is a good team but not a great one. It is not the most talented team I’ve ever had.” As we read his comments, no one was upset or angry because we all knew who had preceded us. But to say his comments had no effect would be wrong at the same time. My opinion to this day is that it served to focus us individually in ways which are the mysterious source of chemistry in all sports. We beat Paducah Tilghman and their excellent pitcher Gary Harris in the first round, 4-2. Jimmy Howes pitched an excellent ballgame, shutting down rallies with a very effective curveball. It was Jim’s best pitch, actually. In spite of his huge and intimidating stature, he was in the end a finesse pitcher with an excellent curveball. He managed to keep it low in the strike zone and created abundant ground ball outs and double plays. Our fireballer, Larry Shown pitched the second game against upset winners McKell and their pitcher eventual Cincinnati Red Don Gullet in the semifinal game. It was a lopsided win, 11-3, as the bats were hot and the strikeouts mounted for Larry. He simply overpowered them and Owensboro hit well. In the Championship Game, Owensboro and Bowling Green matched up in an absolute extra-inning classic. The remarkable lefty, Stan Markham, was busily putting a legendary stamp on state tournaments and was the ace of the tourney so far, winning the first two games in indefatigable fashion and bringing heat and intelligence against us in an awesome pitching display. We countered with Jim Howes. Bowling Green threatened early in the game, loading the bases with no one out but we were absolutely bailed out with a one out double play line drive hit to Pulliam at second by the powerful Jimmy Oller, who threw to me at second for the very key double play to end the inning. The game proceeded at 0-0 forever. Both pitchers fell into absolutely unhittable rhythms. Then, in the 7th, home team Bowling Green once again loaded the bases off Howes. With two outs, the excellent batsman David Wolf then hit a shot up the middle which took a tricky bounce I remember tracking as time seemed to slow down. I adjusted and speared the nasty bounce, then flipped to Pulliam for the force play to end the inning. Wolf gives me grief to this very day on that play. In the top of the 8th, Owensboro managed a walk and a Frank Chambers bloop single to right which fell between fielders and which out runners at 2nd and third. 1st baseman David Anderson then stepped to the plate in a lefty on lefty dual and drilled an absolute bullet up the middle to drive in two runs. The celebrating was about to begin. Taking the field in the bottom of the 8th for the clinching inning was a case study in the nervousness of “closing out” in the sport of baseball. At the strictly personal level, one’s heart simply beat inside one’s throat. The heady sensation of being this close to victory and Jack’s and Owensboro’s first-ever state championship was slightly and literally mind boggling. Giddiness mixed with a self-admonishing search for grit accompanied the play. As the outs tumbled by in a near blur I remember throwing the all around the infield and aiming a curve ball at David Anderson, who was obviously as sky-high as I was. He gave me this ridiculously huge grin after he adjusted to it and we continued. Finally, we got the last out and the celebration was on. This was a surprise find during a search for my Dad (Frank Chambers) online. Thanks for sharing such a wonderful story. I can’t wait to share it with my son.